In Canada, suicide is among the top causes of death for youth and young adults. For males 15 to 19 years of age, there was a 23% decline in the suicide rate between 2000 and 2009. For females, the suicide rate remained relatively stable over this period. 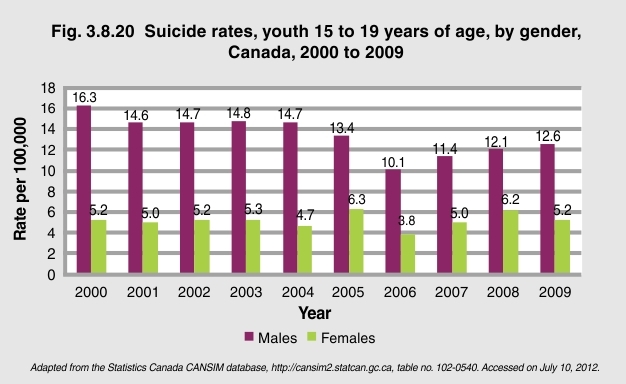 Young women attempt suicide more often than young men; however, young men succeed more often than young women1 Poor mental health has a significant impact on the overall health and well-being of Canadian youth and young adults and can lead to tragic outcomes in this age group2. 1Canadian Institutes of Health Research (2005). Gender and Health. Accessed on May 28, 2012, at http://www.cihr-irsc.gc.ca/e/documents/gender_health_mpkit_2005_e.pdf. 2Government of Canada (2006). The Human Face of Mental Health and Mental Illness in Canada. Accessed on May 28, 2012, at http://www.phac-aspc.gc.ca/publicat/human-humain06/pdf/human_face_e.pdf.